On the week when a key Senate Democrat unveiled a long-awaited bill, the battle over health care reform was the No. 1 story—the eighth time in nine weeks that issue has topped the news agenda. The health care debate, fueled by Senator Max Baucus’ proposal, accounted for 17% of the newshole the week of September 14-20, according to the Pew Research Center’s Project for Excellence in Journalism. While that is a significant drop from the previous week (32%), when Barack Obama’s prime-time speech drove the coverage, the subject was particularly dominant in the media sectors that feature talk shows, radio (31%) and cable (28%), according to PEJ’s weekly News Coverage Index. But another storyline, one simmering since the summer’s boisterous town hall health care showdowns, emerged in the media narrative last week in a substantial way. It was the sensitive and politically thorny issue of whether race is a factor in some opposition to Obama and his policies. A series of recent events—the September 12 Tea Party protests, Congressman Joe Wilson heckling Obama during his September 9 speech and ex-President Jimmy Carter’s assertion last week that race motivates some Obama detractors—triggered a press examination of what is often called the “third rail” of American politics. Last week, Obama’s race was a significant element in fully 25% of the stories in which he was the prominent figure. Depending on what transpires from here on, we may look back on this week as a significant one in Obama’s presidency. That may be one reason why the President himself discounted the idea that race was an issue in the criticism of his efforts to reform health care. The No. 2 topic in the news last week was the economy (at 13%), and on the one-year anniversary of the Lehman Brothers bankruptcy that helped trigger the crisis, the subject generated its highest level of coverage in seven weeks. The third-biggest subject was the murder of Yale graduate student Annie Le (7%), with a lab co-worker being arrested for the crime. The No. 5 story was the conflict in Afghanistan (4%), where much of the coverage focused on Obama’s pending decision about whether to bolster troop strength. The biggest event in the media narrative of health care last week was the long-anticipated release of Senate Finance Committee Chairman Baucus’ bill, a measure quickly criticized from both the left and the right. Some of the coverage analyzed key elements in the proposal. Other stories focused more on the political equation. Yet another health care-related theme continued to reverberate in the media last week—the continuing fallout from South Carolina Republican Congressman Joe Wilson’s “you lie” shout during Obama’s September 9 speech. Last week, the House of Representatives—by a 240-179 vote—passed a resolution disapproving of Wilson’s outburst, largely along partisan lines. At various times during the presidential campaign and Obama’s tenure in the White House, race and racial politics have become a notable story. Obama’s March 2008 speech on race—a response to the uproar over remarks by his long-time pastor Jeremiah Wright—was widely viewed as a crucial moment in the campaign. Two months ago, the President’s statement that the Cambridge Massachusetts police had “acted stupidly” in the arrest of black Harvard professor Henry Louis Gates helped make that episode the No. 3 story for the week of July 20-26. 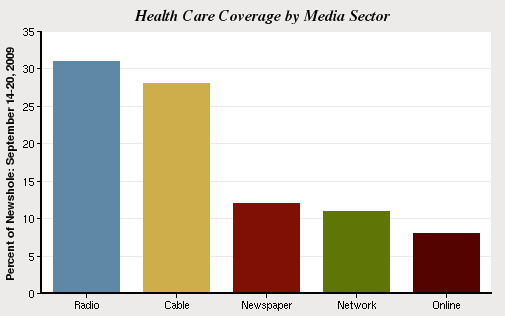 Last week, Obama’s presidency and race intersected once again in the press, accounting for 5% of the coverage. This time, the principal question was whether there were racial overtones to some of the fervent opposition to his policies—with the Wilson incident serving as one of the more dramatic examples. But in this hot-house environment, the administration’s low-key response became a story in and of itself. “In Latest Race Debate, White House Sits It Out,” declared the headline on a September 17 New York Times story. The next night on his CNN show, Anderson Cooper previewed a panel discussion by declaring that it “is safe to say [race] is not what [Obama] wants to be talking about.” He then posed a question that the media may be better positioned to answer than the White House. Filling 13% of the newshole from September 14-20, the economic crisis generated its highest amount of coverage since early August. And while the economy received only modest attention in the cable and radio sectors, it was the No. 1 story online (20%), in newspapers (17%) and on broadcast network news (17%). The major event last week was Obama’s speech on Wall Street one year after the Lehman Brothers collapse that helped trigger a massive bailout of the financial sector. Last week, the President’s message to bankers was a cautionary one. The week’s third-biggest story (7% of the newshole) was the case of Annie Le, the 24-year-old Yale graduate student who was murdered days before her wedding and whose body was found in the basement of a campus laboratory. A worker in the lab, Raymond Clark, was arrested for the crime. The tragedy got the most attention on network TV (16% of the newshole), but the level of coverage varied dramatically on the morning and evening news shows. On the nightly broadcasts, Le was the fourth-biggest story (7%). In the morning, the murder was the top subject, accounting for almost one-third (32%) of the week’s coverage. The fifth-biggest story—coming after the race-related storyline—was the conflict in Afghanistan (4%), although attention was down from the two previous weeks when it accounted for 9% of the newshole. A story that ended up No. 6 for the week (at 4%) ignited charges of liberal bias against the mainstream media by some conservatives. Undercover video from activists posing as a prostitute and pimp showed workers of the community group ACORN offering advice on potentially illegal activities and led to a cutoff of funds by Congress. Some critics argued that the media was slow to pick up on the story, a sentiment broadly echoed in a column by Washington Post ombudsman Andy Alexander. The story generated the most attention on cable news (9%), with the Fox News Channel aggressively covering it. 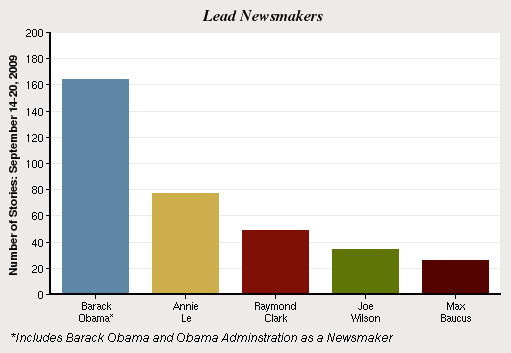 With the impact of race on his presidency emerging as a key narrative, Barack Obama was the week’s top news generator, registering as a lead newsmaker in 12% of the stories. That is, however, down from 19% the previous week when he delivered the crucial speech on health care reform. The second-biggest newsmaker (6% of the stories) was murdered Yale student Annie Le and the alleged perpetrator of that crime, Raymond Clark, was next at 4%. Congressman Joe Wilson, reprimanded by his House colleagues, was among the top newsmakers (3% of the stories) for the second week in row, finishing at No. 4. And Senator Max Baucus, whose health care bill became the focal point for the legislative battle last week, was the fifth-biggest newsmaker at 2% of the stories.